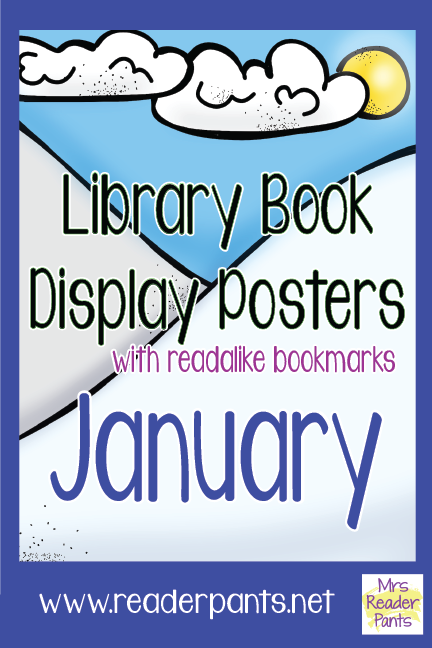 Okay, I know January is the LAST thing we want to think about while we're all singing Christmas carols, dancing around in ugly Christmas sweaters, and guzzling our weight in eggnog, but...the January Display Posters with Readalike Bookmarks are ready! Can I just tell you how much I love designing these posters every month? As you may have seen from my recent Instagram drawing challenge with @librarianzee, I am unfortunately not so gifted in the freehand-drawing department. But I LOVE Adobe Illustrator! 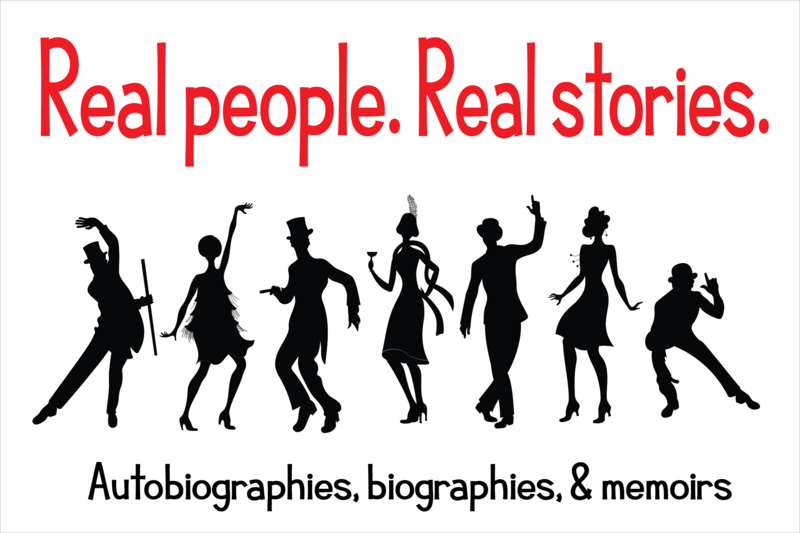 I learn something new in AI just about every day, and I've invested in lots of cute fonts and clipart that help make the posters truly POP. 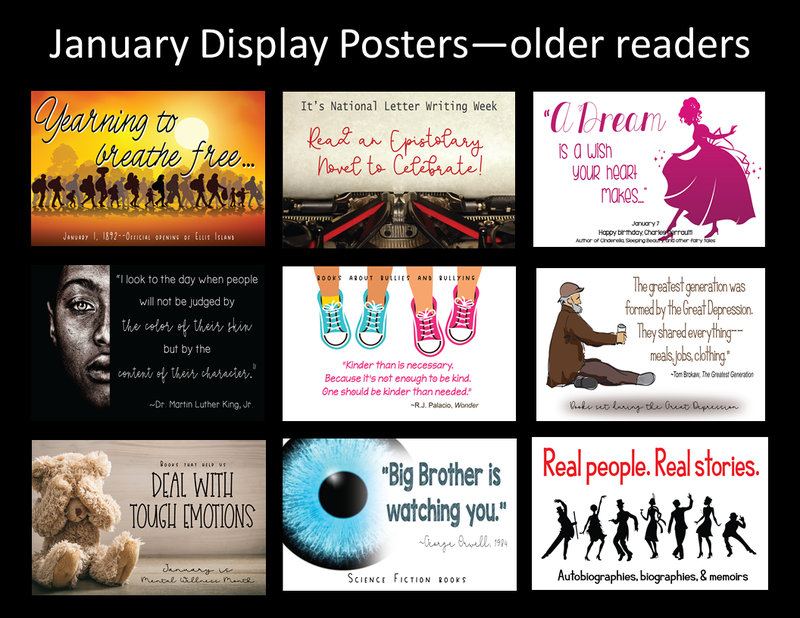 I am really happy with how the January posters turned out, and I think you'll love them, too! So this month (and only this month, I hope), I created two posters for each of the nine themes. 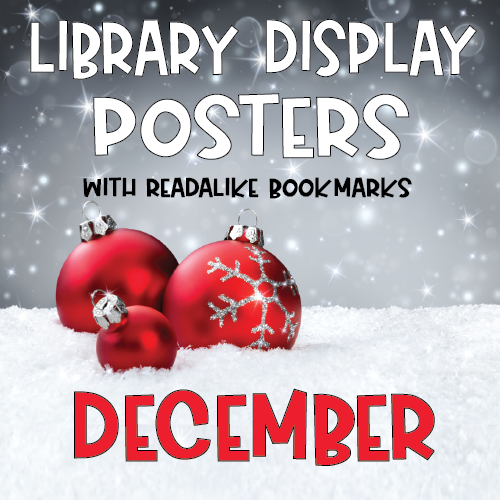 I didn't set out to do that, but I felt some of the posters were much better-suited for older readers or younger readers. In those cases, I made alternate posters. Ultimately, all the posters ended up with an "older readers" version and a "younger readers" version. I do not plan to do that every month, so enjoy it while it lasts! I've also been more cognizant this month about making my posters more printer-friendly. Several of this month's posters are printer-friendly, with white backgrounds instead of full-color backgrounds. You're welcome! There honestly isn't much to January. It's cold. The holidays are over. Outside New Year's Day and MLK Day, there are no major holidays. And let's be honest: School is the last place any of us wants to be. January is like a bad hangover that clears ever-so-slowly until Valentine's Day finally gives us something interesting to do. Yep, I'm a cheery one about January. It's my least-favorite month by a whole lot. 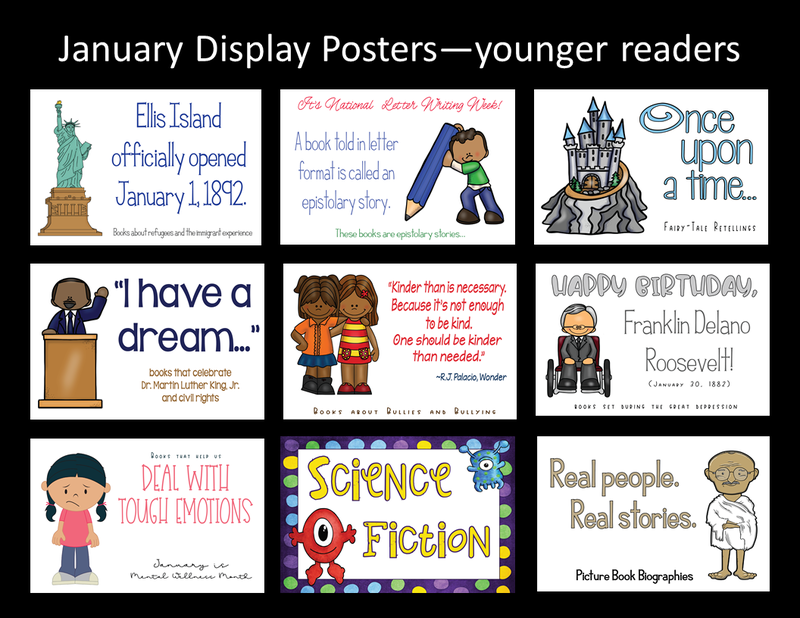 Don't forget that each poster theme also has an editable readalike bookmark for four different age levels (picture books, elementary, middle school, and high school + adults). I hand-selected each and every title to ensure it is currently in-print and available on Titlewave and/or on Amazon. I include many 2018 titles, and now that we are approaching 2019, I've started adding a few early-2019 releases as well! 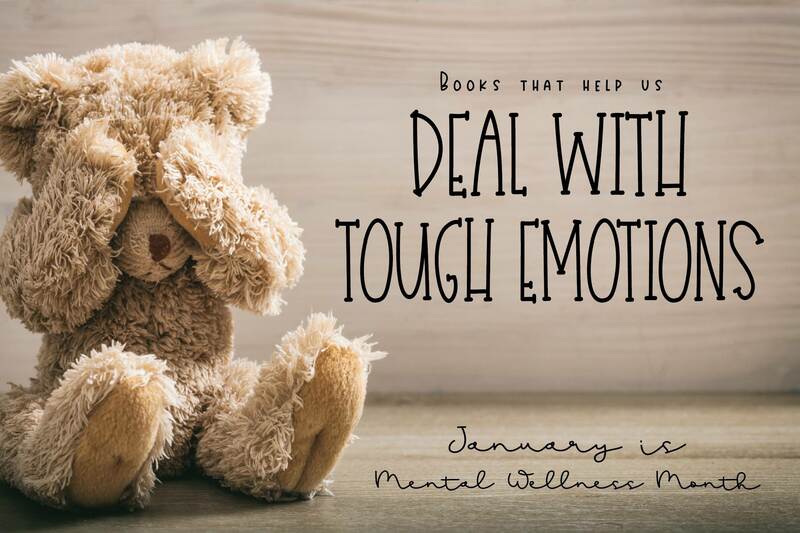 Every title I list also receives positive reviews from professional publication and/or a high Goodreads average rating. If it's not good enough for my library, I don't include it on the bookmarks. 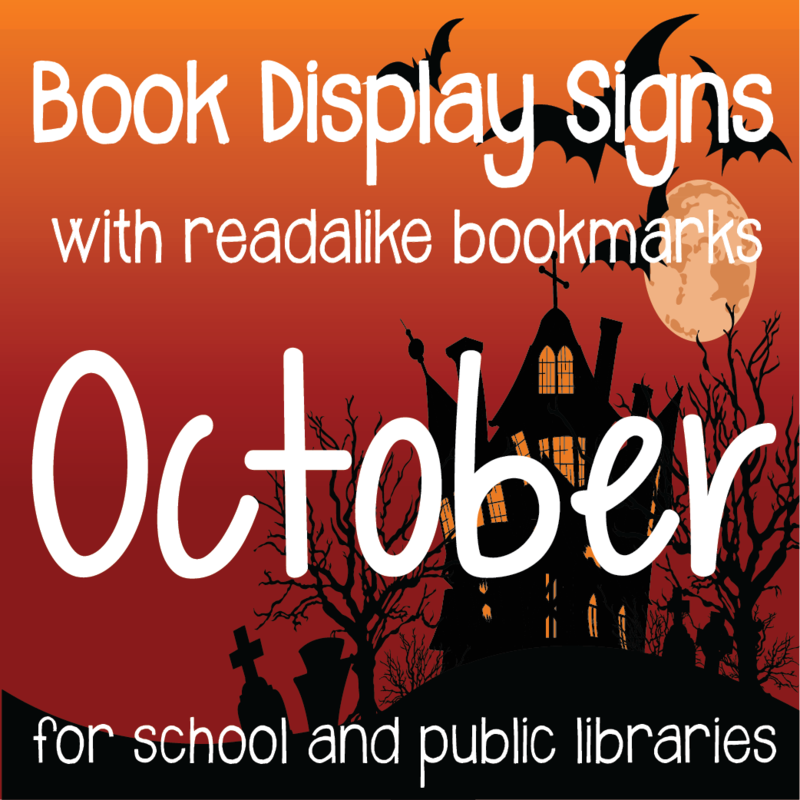 For all these reasons, the bookmarks are excellent collection development tools for any school or public library. 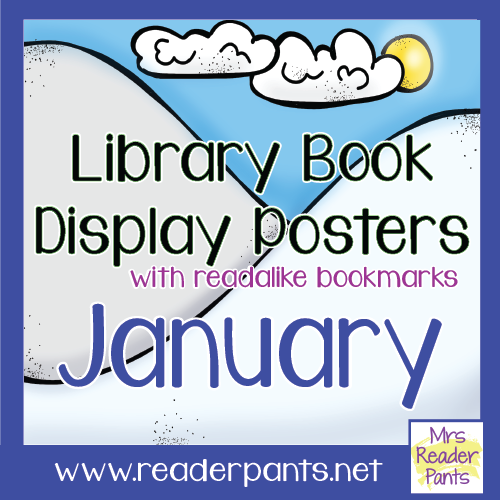 As with my previous months' posters, this January set is a growing bundle. 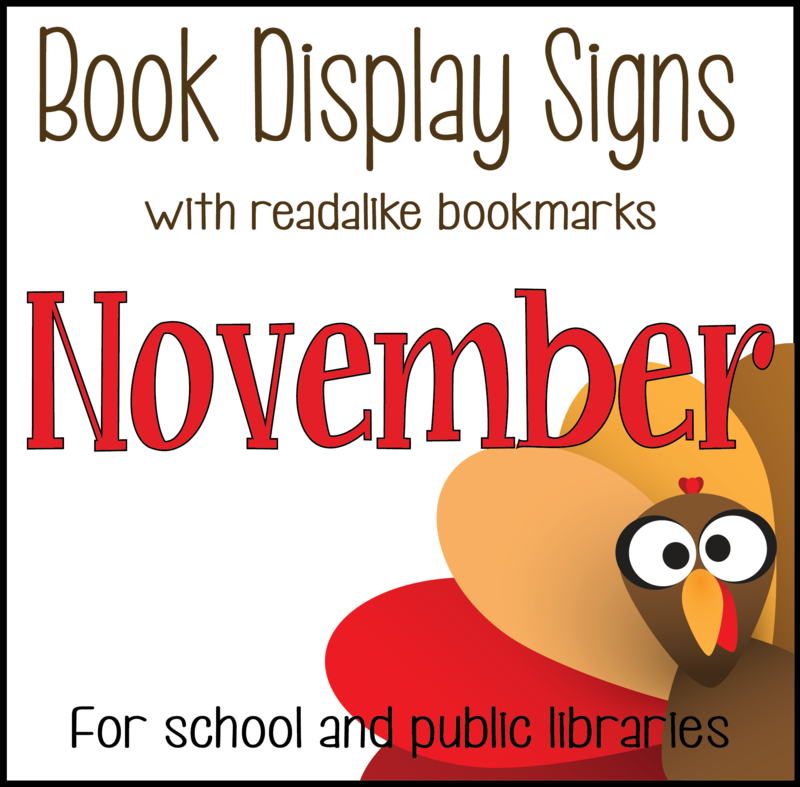 I will add new posters and bookmarks each year, and once you download the set, you will receive all future updates free. You are amazing and generous, Leigh! Thank you for sharing your beautiful work. I've been looking for this to come out every day! Thank you for sharing these! 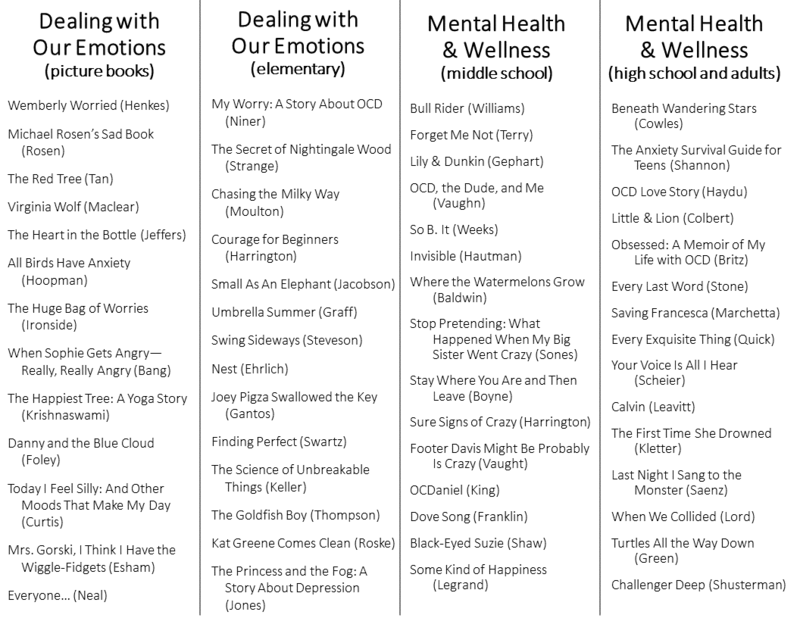 They save me so much time when working on displays, and I love seeing the books you suggest for each topic. Thanks for the shout out! I think you should keep trying on the drawing challenge, but I understand how you may feel way more comfortable with adobe illustrator because canva.com is my groove! I use it like nobody's business! I love that thing! My boss is even considering getting me a paid version. WOOT! Anyway, thanks for these free materials! You are too sweet to be so generous with us all! You are now the second person to tell me that. Is it that "something went wrong" message in PowerPoint? Have you tried re-downloading it and/or opening it on a different computer? I will re-upload the file on my end, too, and I will send TPT a message about it. I'm not sure why that's happening. "We're always happy to assist Buyers with any issues. We've seen that Buyers with older versions of PowerPoint such as 2007 may face compatibility issues. Also, there could be compatibility issues even between Mac and Windows users. Sorry to bother you, but the download is not working for me. I click it and the page re-loads, but doesn't redirect me or download anything. It's not a PowerPoint issue like mentioned above. It is that it simply doesn't allow me to download. If you still cannot get it to download, I think this is a question for TPT tech support at https://www.teacherspayteachers.com/Contact. They are very fast about getting back to you, and I have found them very helpful when I've had questions. I just downloaded the file, and it opens just fine for me. The download did take a few minutes (it's a large file), so be sure to check your Downloads folder to make sure it isn't there. Please keep me posted to let me know.